Our post from July 23 showed the first half of the process for our 18″ Wisteria shade. We have been commissioned to create a matching pair of 18″ Wisteria lamp, so while Irwin continued with the soldering of lamp number one and Bill began cutting the second lamp. 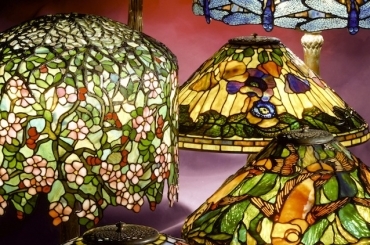 Since this is to be a matched pair, both lamps had to be laid out simultaneously. 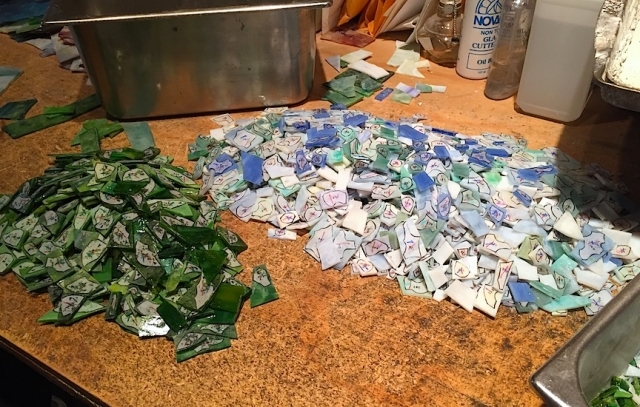 The 1945 pieces for the second lamp are shown in the photo above, ready for cutting. Once all the pieces are cut, fit, foiled and transferred onto the waxed form, the soldering begins. Soldering a Wisteria shade presents several unique challenges. 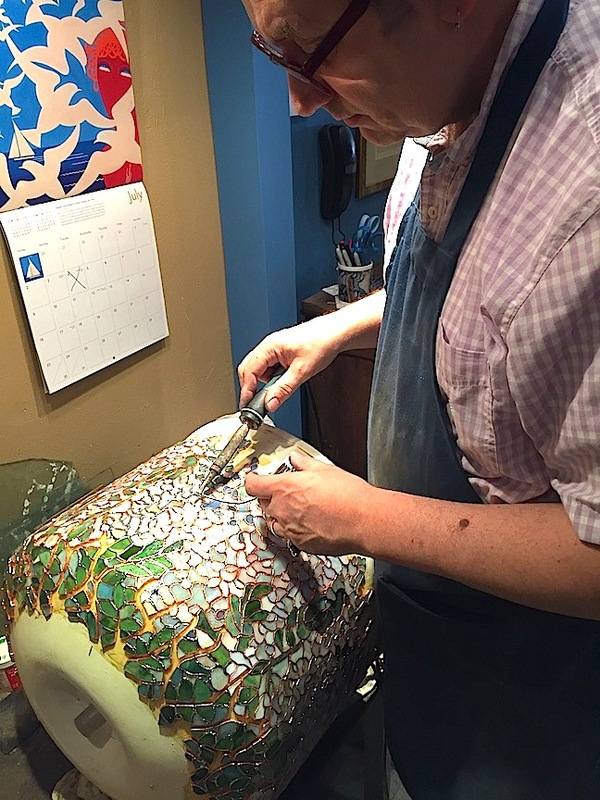 The heavy cast crown at the top prevents Irwin from using our shade holder while soldering, so the shade must be carefully positioned on our soldering table. Once the exterior has been completely soldered, the top crown is re-positioned and permanently attached to the top of the shade. This shade also has cast metal branches that extend downwards from the crown, and these also need be for soldered in place before the shade can be removed from the form. With the crown in place, the shade becomes very top heavy and care must be taken when moving it into position for soldering the interior. A network of reinforcing wires, added to the inside of the shade, provide additional strength to the piece. Positioned to follow the curvature of the lead lines of the pattern, the wires become invisible support for the finished shade . Once all the reinforcement is in place, the interior soldering of the shade is completed. The final step in the soldering process is to add a half round copper wire to the lower edge of the shade. This edge provides strength and stability and also visually finishes the bottom of the shade. We have been working steadily for the past two months on this project and are nearing completion on both lamps. The finished lamps will be shown in a later post.